A Petition on the British Government Web Site warns Israeli coalition leader he could be arrested for complicity in alleged war crimes if he travels to Europe. 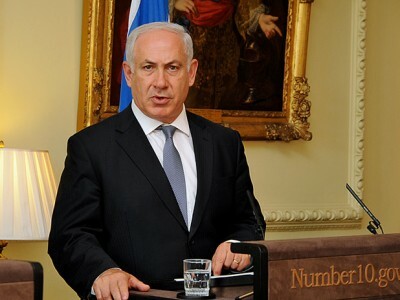 Benjamin Netanyahu plans to hold talks in London onSeptember 9th. Under international law he could be arrested for alleged complicity in commissioning a war crime in 2014 when he authorised the documented killing of over 2000 civilians including hundreds of children in an attack upon the Palestinian population of Gaza as a reprisal against militant protestors of Israel’s seven year long illegal blockade of essential supplies. The illegal blockade of 1.8 million Palestinians in Gaza, under the pretext of arms control in order to maintain Israel’s illegal occupation of the West Bank, has included the killing, in international waters, of unarmed civilians aboard the Turkish registered vessel, the Mavi Marmara, in May 2010, which was carrying humanitarian supplies. Forensic teams subsequently identified some 250 (Israeli) bullet holes in the ship. During the struggle, nine activists were killed including eight Turkish nationals and one Turkish American, and many were wounded. A tenth member of the flotilla subsequently died in hospital after being in a coma for four years. Netanyahu was severely condemned for this atrocity and Israel was forced to apologise and pay substantial compensation to the bereaved families. But no one has yet been brought to trial. Another international atrocity was the assassination of a Palestinian political activist in a hotel bedroom in Dubai, in 2010, by agents using forged EU passports. No one has yet been brought to trial, either, for this killing. Britain’s foreign secretary subsequently expelled an Israeli diplomat after the UK turned up evidence that Israel had forged copies of British passports. The Australian government also expelled an Israeli diplomat after concluding that there was “no doubt Israel was behind the forgery of four Australian passports” related to the assassination. Similar action was taken by Ireland. It is very clear: Britain and all EU states have a duty to detain anyone suspected of complicity in the commissioning of a war crime and where there is sufficient evidence, of bringing them by force if necessary before the International Court. It is also clear that the British government should not trade or negotiate with anyone so suspected, and certainly should not offer immunity from prosecution.